The options for customization in apparel are endless. Do you need a professional look? We embroider. Do you need a quick turnaround time? Try our sublimation services. Do you want to customize your design? Screen printing might be the way to go. Our expert staff can help you find the materials and process that fit your unique needs. Screen printing produces vibrant color, can be used to print on virtually any surface and allows for unique customization. The higher the quantity ordered, the better the per piece pricing. Take a look at our some of our recent screen printed apparel and contact us to find our if screen print is the right application for you! Sublimation is a process which uses special heat-sensitive dyes to print graphics, text and virtually any image onto special transfer paper. The paper is then placed on the pre-cut fabric pattern and both are placed into a heat press. When the heating cycle is completed, the image on the paper has been completely transferred to the item, producing a smooth surface. Sublimation is always done on a polyester, polymer, or polymer-coated item. It’s a great application for team uniforms and heavy use items and can be ordered in small batches. Embroidery is the method used for decorating fabrics with a needle and a thread, creating a raised pattern sewn directly into the garment of choice. At Color Fusion we have an embroidery specialist on staff with the ability to create custom designs for any and all applications. Click on the catalog images to browse products. If you find something you’d like a quote on, add it to your inquiry on those sites. Please Note: Pricing shown on the products within the catalog sites do not include embellishment such as silkscreen, embroidery, sublimation, etc. 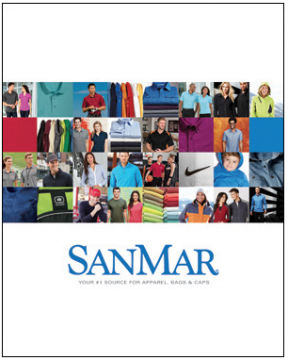 Catalog pricing is for the style, material and quantity of product needed. Costs for printed embellishments, based on your customization needs, will be included in your final quote.